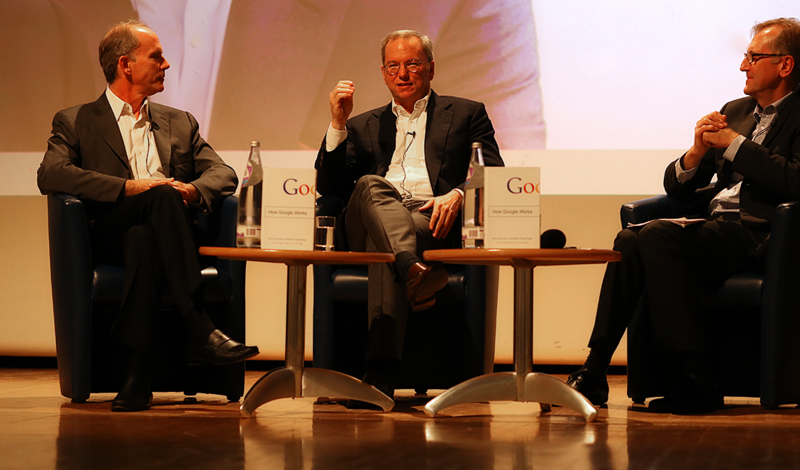 Eric Schmidt & Jonathan Rosenberg have been touring the world talking about ‘How Google Works’. Eric is the former CEO of Google, and current ‘Executive Chairman’, Jonathan is the former SVP of Products at Google. Much of the talk was a condensed version of their book “How Google Works”, but there were a few extras in there, and a short Q&A at the end. The overall message of this discussion was that Eric Schmidt’s biggest role within Google was to bring money in & grow it from that point of view. Eric put forward that his overriding rule for whether something should happen or not was “revenue solves all problems”. If there was a big dispute in direction to be settled, that was the guiding principle he often turned to. That sounds obvious, but often writing around Google concentrates on the ‘non-money’ parts of things: big, bold innovations that have no obvious short-term money making potential; products that are very interesting, but less commercial, etc. The suggestion I took from this discussion was that the ‘real’ Google is deliberately a money making machine, which enables all of the rest to happen, rather than a group of massively exciting ideas that also coincidentally makes money. Knaves – people who claim credit that’s not really theirs, people who cause problems in groups, people who gossip, etc. Divas – people who are excellent at what they do, have the ability to produce excellent things, but are hard to manage, do not necessarily fit in socially, and are prone to upsetting other people. On Divas, the point was that these people can appear similar to ‘knaves’, but that an organisation wishing to achieve success should fight hard to keep them. These are people who are capable of delivering immense value, but in normal day-to-day environment can be difficult to work with. A couple examples I’ve seen him mention elsewhere as ‘divas’ were Steve Jobs & Serena Williams. I’m not sure either of them would have wanted to work for Google, but the suggestion is if they did, Google should fit in with their behaviour as much as possible, rather than the other way round. Jonathan suggested that the point at which a company’s culture becomes poisoned is when the ‘knave density’ reaches a tipping point. I guess for a small company, that could be a single person, for a larger company it may depend on both the ‘density’ and their position. Eric Schmidt felt: “Most people pay lip service, but they aren’t really systematic.” He suggested Google has thoroughly tested interview systems and that, for them, five interviews per candidate is the ideal amount (he didn’t qualify whether this was specifically for engineers, or for all jobs, but I expect it doesn’t span to every role). A system that simply asked employees once per week what they were doing, how they felt, etc. This turned out to be good for organisational memory, and for spotting potential problems. A period where they went through assigning 120 direct reports to 1 executive. They found that this cut out all possible micromanagement and, while probably not scalable, had lots of positives. A ‘rule of 7’. Unless someone had 7 direct reports, they could not be a ‘manager’. Again, this was related to minimising micromanagement, and avoiding job title creep. And at a much wider level, he put forth that building a great company is about building a platform: “Real growth comes from building ecosystems. Ecosystems come from building platforms that provide huge value.” I took from this that he was referring partly to the more nebulous ‘culture’ of a company, and to its systems, processes, technology, financial, and ‘people’ setup. As with every Google discussion with a general audience, the “Don’t be evil” question came up a couple of times. In the Q&A in particular, someone asked them quite a specific question about whether some particular activities they’d carried out were evil. The question was clarified a couple of times, before being dismissed as not evil. Eric Schmidt relayed that the very first time he heard someone use the phrase: “I actually thought it was a joke”. The “don’t be evil” point comes up so often in popular culture that if you’ve never looked into where it came from, it’s worth doing so. It was coined apparently by Amit Patel, & championed by Paul Buchheit, who subsequently left to found FriendFeed (acquired by Facebook), before becoming a partner at Y Combinator & an investor. Paul apparently wanted a phrase that – once it caught on – the organisation would find difficult to backtrack from. The phrase has certainly stuck, but whether the ethos has depends on your perspective. 5. HiPPOs run meetings at Google. The final point I’d noted down was that, at Google, Eric & Jonathan said the much maligned ‘HiPPOs’ run meetings. (for those unaware of the term, HiPPO = ‘highest paid person’s opinion’; it used to be a common gripe that some organisations were run by ‘hippos’ – people who made decisions purely on the basis of their instinct, and must be followed based on their status within the organisation). The job of the exec (‘highest paid person’) is to get everyone talking & move the agenda forward. Everybody argues about the data. “If you have a bit of a disagreement then you end up having to have a real conversation”. When actions fall out of the discussion, everyone sees both the actions assigned to them, and the actions assigned to everyone else. Everyone leaves understanding where they stand, what they have to do, and by when. As mentioned at the start, these are expanded from notes I’d gathered on my phone. The event was run by the FT & despite running short (they blamed Eric Schmidt for this), and obeying the ‘revenue solves everything’ motto themselves by not handing out the books included in the ticket price, it was an interesting & useful insight into a few of Google’s principles, but more particularly into Eric Schmidt’s perspective on the world & on the company he shaped. Do feel free to add comments below if you attended one of these events, read the book, or simply want to expand on any of the above. And do share this with others if you found it either useful or interesting.